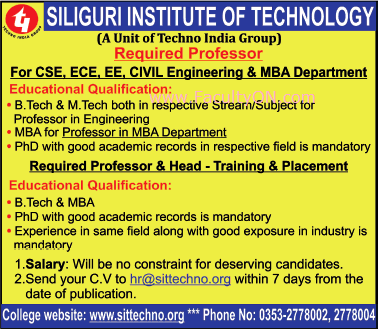 Siliguri Institute of Technology, Darjeeling has advertised in THE TIMES OF INDIA newspaper for the recruitment of Teaching Faculty- Professor Plus Placement Officer jobs vacancies. Interested and eligible job aspirants are requested to apply within 07 days from 12th September 2018. Check out further more details below. How to Apply: Eligible and interested candidates are required to send their latest CV with Photograph and copies of certificates to the college email address mentioned below.